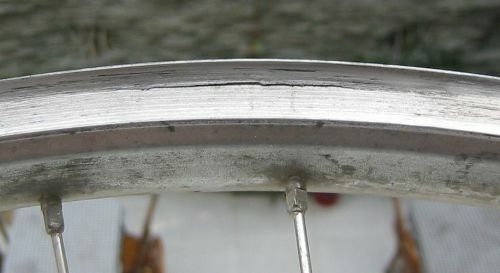 Rim wear is a problem all long distance cycle tourists should be aware of. It is a particular problem if you enjoy mountainous or grit covered roads. In a bad case the wheel can collapse catastrophically when the rim fails, pitching the rider over the handlebars if it is the front one. I'm glad to say that I merely became aware of a rubbing brake block and cycled several hundred meters before I discovered the source of the problem. The only true solution is to use disc brakes. Another possibility is ceramic coated rims which give a much longer life, although you do need special brake blocks and they can squeal badly. For most people it is sufficient simply to keep an eye on the condition of the braking surface and not be afraid to replace the rim if it looks badly worn. An easy check to see if your rims need replacing is to remove the tyres and run your thumb and forefinger up and down each side of the rim's brake surface,if it is badly concaved its time for some new ones. Best to take no chances with rims, even more so with the front! By the time the brake blocks start to stick on because the rims are so concave, its too late. Another check is to set the brake pads close to the rim with the tyre flat, then pump the tyre to the maximum allowed tyre pressure and see if the brakes rub. If they do it means your rim has expanded and should be replaced. I found that the front rim split when it was on its fourth set of brake blocks. After it had split we measured the thickness of the braking surface and found that it was about 1mm, compared to the 2mm that a new Ryno has. Then you can carry Schraeder valve spares if that is all you can obtain, and fit them interchangeably with Presta valve inner tubes. 36 hole rims and hubs proved quite hard to obtain even in the good bike shops of China and Thailand. Mountain bikes seem to have gone over to 32 holes.